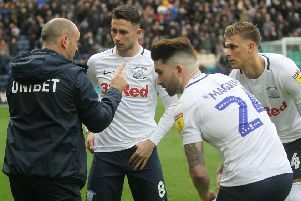 Blackburn Rovers boss Tony Mowbray lamented his side’s performance in the final third after they slipped to a 1-0 to Preston North End on Saturday. Daniel Johnson scored the only goal of the game eight minutes in as PNE extended their Championship unbeaten run to 10 games at Ewood Park. Rovers had 20 shots to the Lilywhites’ six but only five of them were on target. Declan Rudd was most stretched by his own player, saving well down low to his right after Ryan Ledson had diverted Amari’i Bell’s cross goalwards. "The attributes of this team are there on show every week,” said Mowbray. “This was pretty much the same as the performances we’ve had all season. “At this moment, we're not able to turn them into goals or victories. “Performance wise, effort wise, desire, commitment, drive, honesty, they were all there. “The bit that makes the difference, the quality around the final third, the final pass, the final contact on a finish, that wasn’t there. For Rovers it was a sixth defeat in seven as their slide down the Championship table continued, Mowbray’s men down to 17th as PNE moved up to ninth and four points shy of the top six. “We just have to stick together, keep working hard,” he said. “If I could see a drop off in their desire and determination to get results then I would be more concerned. “I don’t see a drop off. At this moment we’ve hit a patch when we can’t win a game.